Oscar-winning movie Zero Dark Thirty chronicles the decade-long hunt for Osama bin Laden, from the terrorist attacks of September 2001 to the al-Qaeda leader's discovery by a US Navy S.E.A.L. Team in May 2011. John plays the small role of Jeremy, appearing in several scenes alongside the late James Gandolfini's CIA Director. In the movie's trailer, which can be viewed on the movie's official website (link below), John can be seen briefly in a conference room scene. 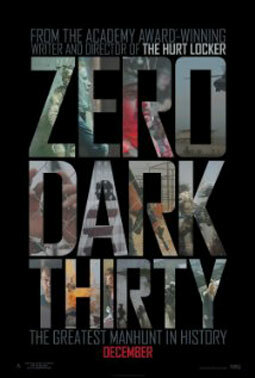 Zero Dark Thirty was released on 25 January 2013. Entertainment Weekly: "Once in a long while, a fresh-from-the-headlines movie - like "All the President's Men" or "United 93" - fuses journalism, procedural high drama, and the oxygenated atmosphere of a thriller into a new version of history written with lightning. Zero Dark Thirty, Kathryn Bigelow's meticulous and electrifying re-creation of the hunt for Osama bin Laden, is that kind of movie." The Guardian: "Telling a nearly three-hour story with an ending everyone knows, Bigelow and Boal have managed to craft one of the most intense and intellectually challenging films of the year." Hollywood Reporter: "The film's power steadily and relentlessly builds over its long course, to a point that is terrifically imposing and unshakable."